A single page layout with dated text layout and very limited imaging. From my first meeting with Denny, I could tell he was going to be a character. Denny is a lifelong advocate for the Tennis Industry. 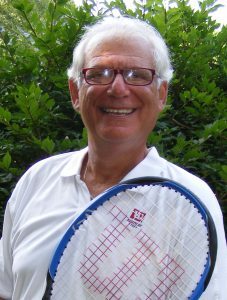 Having served as coach at the high school and collegiate levels as well as an organizer through multiple regional and national Tennis organizations. Denny also worked for a time in the sporting goods industry as a Territory Manager for Wilson Sports. Denny has served the tennis industry in some capacity his entire career. Denny’s reach expands beyond the educational arena, as he maintains relationships with the leadership at multiple tennis clubs throughout the region. Denny serves as a liaison between club management and Tennis Industry Professionals. When Denny and JRS Mar/Com connected, there was a need for an updated website. His existing single page layout was not responsive and looked dated. Also, there was no contact form for submitting resumes and collecting data. The presentation of information to his millennial aged candidates necessitated a mobile responsive web design. After executing keyword research, we determined there was a content opportunity in some industry specific terminology. We were able to incorporate the terms with high monthly search rank while combining his targeted constituents into three headings: Pros, Clubs, and Students. With a focus of legitimizing his business with future prospective clients, we decided on a three column website with an image slider on the home page. 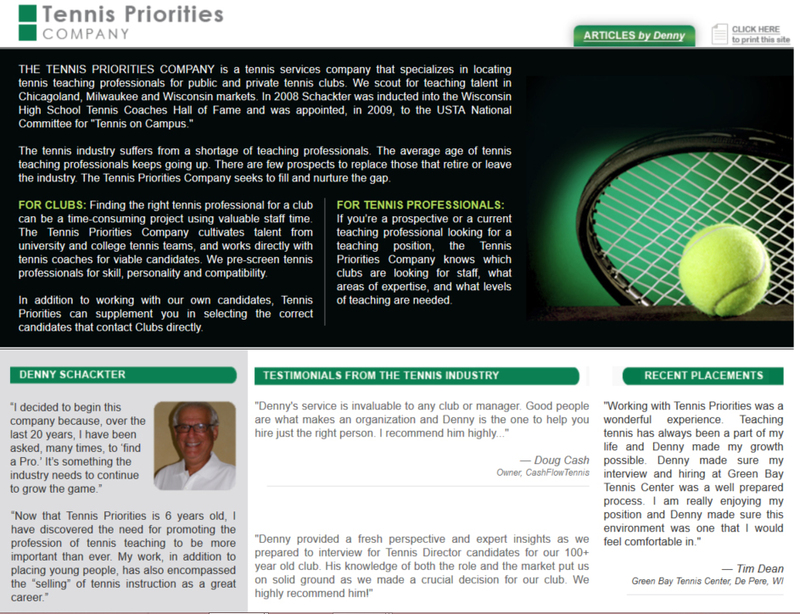 We selected Tennis themed images relevant to informing visitors of exactly what he does with Tennis Priorities Company. Finally, Denny wanted people to be able to submit resumes electronically. The contact submission form placed in the footer of every page, allows for resume submissions to be collected and stored in his database. The additional information will be collected and utilized for future industry specific communications. JRS Mar/Com is a Digital Marketing Agency based in Arlington Heights, IL. Focused on helping small and mid-sized businesses like Denny #BeSeen & #BeHeard, we focus on building websites, managing social media and optimizing for search engines. Much like the clients we help, JRS Mar/Com is led by entrepreneur Joe Skibbie, himself an #SMB trying to connect with clients looking to be found through Digital Marketing Strategy.